My Luna is very close to my son, even if he gives her very little attention. She chose him. I spend the whole day with her, I give them to eat, I play the happy songs with her. She seems asleep in my presence all day and I pay attention only when she wants to eat. She seems to miss my son, but he gets bored fast and does not spend more than 5 minutes with her and later he is disturbed by her insistence . But she becomes talkative, playful, otherwise, just in his presence. Whithout my son, she gets bored and seems sad. My son's attitude can not change for now, becouse he is a capricious teenager. What can I do? Everithing I want,is that she does not suffer. 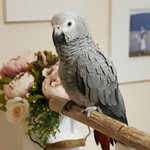 This is very typical of African Greys. They will choose a favourite person and it isn't necessarily the person who spends the most time with them. There isn't a lot you can do apart from interacting with her as much as you can and providing plenty of toys for her. I bought some colorful wooden toys, but she ignores them and seems scared of them. All she wants, is my son's attention. He can do anything with her if he wants to. I hope the toys become interesting after she gets used to them. Luna has come to our house for two weeks, but she has an incredible friendship with my son. They are often afraid of anything new,and it can take time. Play with the toys yourself so she can see. They usually want anything we have. Also you might need to try different types of toy as they can have preferences as to what sort they like. Monty will play with all sorts of toys, especially if they are noisy such as bells or the pan toy I recently bought. Mitzi has never been interested in toys unless it is something she can chew up such as cardboard tubes or paper rolls. Thank you! For now, the toy with the bells scares her. 🙂 He seems more interested in furniture. I will show toys, every day. Today she gave me the head to scratch. For me, it's a great success! Often female parrots bond with males and male parrots will bond with females. It happened with our parrot. My wife wanted a Grey, but she bonded with me. Not something I had planned for but things happen. I think you need to remove the capriciousness from your boy. If you can. Tell him Luna has bonded with him, as far as she is concerned he is her man. It's hard to keep her away from my son. Sometimes she behaves as if my son is her mother. She takes the position of the baby that is nourished, stretches her throat and shakes her wings.